Skiathos is one of the first unknown paradise which was discovered. 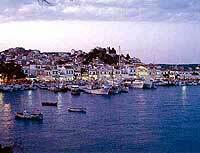 Until then, Skiathos was only known from Papadiamantis. In the beautiful beaches, hotels started to build and the traffic began to increase. Skiathos became one of the most famous islands in Greece. 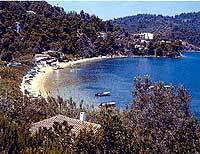 Skiathos has some 70 sandy inlets, several bays and three harbors. Around the island there are no less than nine smaller islands. An island hopper's dream! 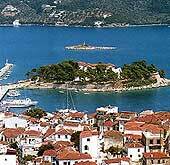 The principle town is also called Skiathos and was built in 1830 on two low hills. It is the hub of the island where you can find some flavourful tavernas. Beaches abound, one special beach, Koukounaries (which means "pine grove") stretches in golden sand for a thousand meters, Most of the beach is shaded by pines and shrubs. An ancient walled town from the 16th century, called the Kastro, protected a whole village, whose residents when threatened would move to the impregnable rock which rises above Skiathos. A drawbridge was their only link to the rest of their island. Skiathos Main Harbor - You should moor on the northern part of the quay in the new harbor.Β The harbor it self offers good shelter from the meltemi. You may also anchor at the head of the bay. There is water available on the quay and fuel is available. There is also good shopping for provisioning as well as several tavernas to eat out at. 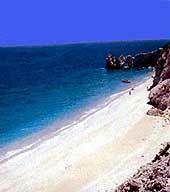 Wonderful beaches in Achladies, Tzaneries and Koukounaries. You can do windsurfing, sailing and play tennis, while visiting the island. Cinemas, night clubs, buzukia fish taverns and restaurants can be found in most of the cities of the island.